It won’t be long before Purple Martins return from their wintering home in South America. The adults generally arrive anywhere from January to May depending on where you live. Here in Kentucky we start to see them around the middle of March. More south sooner and the more north you are add a couple more weeks. The Great Lakes region for example would be about the first of May. Do you have your Purple Martin Bird House ready? Yeah, they really should be cleaned out every fall and plugged up (around late August to mid September) to keep Starlings and House Sparrows away. Some people store them over winter instead and that is up to you. Timing is everything to open them back up. Timing you say? 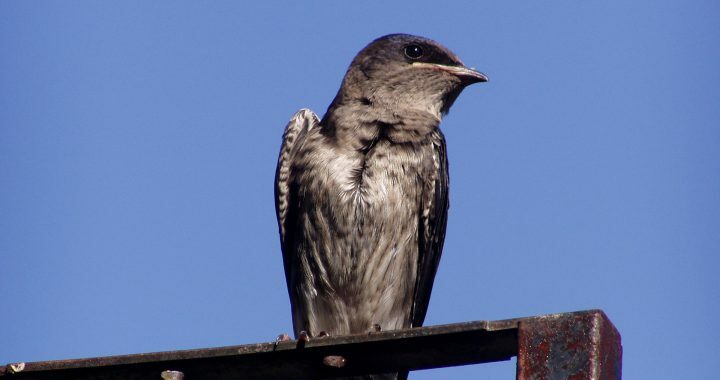 Open up your houses once you start to see Purple Martins coming around. The adults return first (scouts they call them around two+ years). They will be returning to their old digs from the previous year unless something happened to the nest or breeding didn’t go well. Then a few weeks later comes last year’s young who will be looking for a mate. These pairs will be seeking a new place to live so if you have a brand new Purple Martin House, or one that hasn’t been utilized in a year or two, it may attract them in. Just wait a few weeks after the adults arrive to open them up as you do not want to have Starlings or House Sparrows take up residence instead. 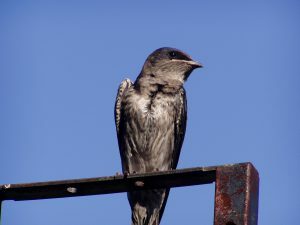 Purple Martins are large swallows (seven to eight inches in length) that can be found in most of North America with the exception of the Rocky Mountain states. A deep, dark, iridescent blue, these swallows have black wings and tail with a hooked bill. Females look duller having some grey at the neck with their underparts a grey spotted coloring. Their diet is mainly insects just like the Tree Swallow just more of a variety. Martins eat ants, spiders, wasps, bees, dragonflies, beetles, moths, butterflies, mosquitoes, and house flies to name a few. This bird is swift in flight doing acrobatic moves to catch its next meal and it dips down, skimming a surface of water for a drink or for bathing. Purple Martins prefer a habitat near water in a somewhat open land but can also be found in more urban areas especially in the east. 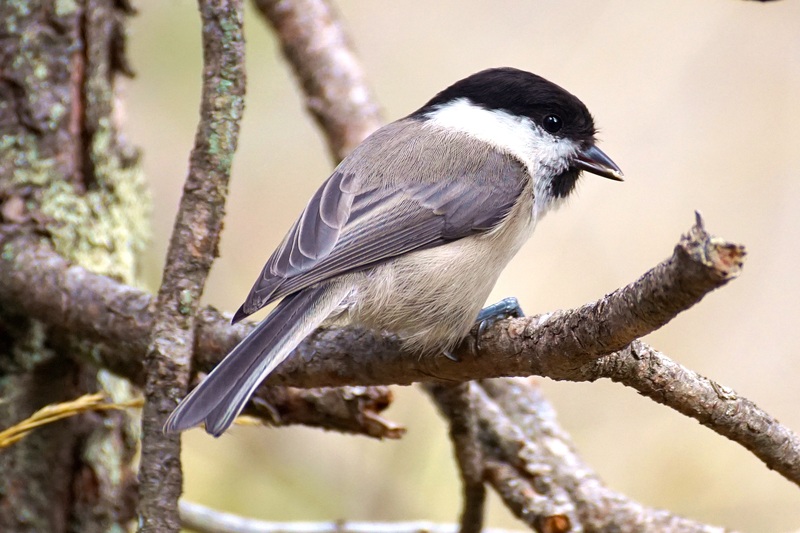 This is mainly because these birds have become dependent on humans for these birdhouses. This started back when Native Americans would hang gourds out for these swallows for various reasons. Later on, the colonists picked up the idea from them. However, land development happened and consequently, habitat was lost for the Purple Martins. Over time it became the new norm for these swallows to utilize the gourds or birdhouses rather than a natural cavity. Out west Purple Martins are still doing it the old way. They use cavities in larger cactus trees (the Saguaro for example) as well as old woodpecker holes, in cliffs and sometimes in buildings. They are starting to adapt to man made houses but not like those in the east. Purple Martins like to live in clustered housing and will nest in colonies of up to 200 pairs. You should start with a unit of at least four compartments with six to 12 compartments being even better. Light colored houses are better as it keeps the temperatures cooler for the nestlings. There are many styles that you can choose from which includes gourds. Accessibility: Martin housing should raise and lower vertically on a telescoping, pulley, or winch system. Housing will need to be lowered, sometimes on a daily basis, to remove competitor nests and to monitor the nests. How High Should the Pole Be? : Recommended height is 12-18’. Poles should be securely set in concrete, with 18”-25” below ground. Many manufacturers offer mounting sockets or stakes, so that landlords can relocate or remove their poles. What Should it Be Made Out of? : Aluminum, thick plastic, wood, and natural gourds are all suitable materials for martin housing, provided that the exterior of the house is white in color. White reflects heat, keeping housing cooler in hot temperatures. Wooden housing should be made from untreated material only. Wood 3/4” thick will provide better insulation against heat and cold. Cedar, cypress, or redwood works well. Plastic houses and gourds should be of thick (preferably UV-resistant) material, and should not allow light to filter through the walls. Place your Martin House in a clear flyway zone and preferably about one hundred feet from your house or outbuilding. They like to see humans around as they have learned that they we will help keep the predators away. Keep vegetation away from the area around the house as it only helps attract predators. Eggshells give martins a source of grit for digesting insect exoskeletons so providing that helps. Keep other species of birds out of the birdhouse ( i.e. House Sparrows and Starlings) by getting rid of their nesting materials. Make sure you have your Purple Martin House ready in time for their arrival. Purple Martins lay anywhere from 3 to 8 eggs and have up to two broods. Eggs are pure white and smooth. The female chooses her mate based on the males nesting site. Adults form flocks as soon as the fledglings leave the nest and congregate in large flocks throughout winter. Native Americans first used gourds to attract Purple Martins. Purple Martins will capture their insects up to 500 feet or more from the ground. Much higher than other swallows. Both the male and female feed their new nestlings with the young leaving the nest at around 31 days. Many people look forward to the return of “their” Purple Martins coming back year after year to their yard. These swallows like to return to the same home or colony from the year before to start new families. I guess you could call it their summer home. The juveniles (last year’s young) will not return to the same place however. They will be looking for a new mate and will form a new colony. That is why a new Martin House is good to have. Purple Martins are great to have around too as part of their diet includes eating mosquitos. Now that alone would do it for me. However, they also eat butterflies, moths, beetles, dragonflies, ants, bees, and wasps as well. You will love watching these beautiful birds in action as they perform their acrobatic moves to catch these insects not to mention hearing their loud vocalizations in the morning hours. Always good entertainment for sure. If you want to attract them just be sure you follow the specifications for the bird housing as mentioned earlier and make sure you have it placed in the appropriate location for them. I guarantee you that you will enjoy them as much as I do. 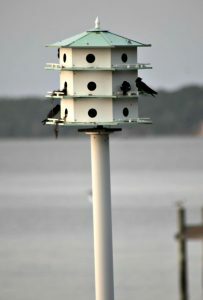 Do you have a Purple Martin House on your property? What is your experience with them? Feel free to make any comments below. Thank you and……..
Posted in Backyard Birds, Landscaping For Birds, Songbirds. Enjoyed this article. I have a big house. I tried for years to have them. I studied all up and am sure my house is in a petfect location. but nothing. Then the sparriws wete so bad I gave up! I want martins terribly bad. I cannot get my bluebirds to stay around. but I have houses and I typically have 2-3 nests per Spring Summer. Yet I raise sll these bluebirds and the won’t eat or fly in my yard! I have loads of birds but these ate my challenges. Thanks for the information. It has revamped my thoughts, but I do/did all these tips you have laid out. I enjoyed this tead. L Satt, You really have to almost play landlord with the Purple Martins. You have to be vigilant on watching the birdhouse and making sure other birds such as the house sparrows don’t try to move in. When you see them taking nesting materials in, get rid of it. Also, make sure they have enough flying space too. They like it to be open. I hope this helps. Maybe this year will be the year :-). Thanks for your comment! I wish I lived in a place closer to the purple martins. It would be wonderful to see them visiting birdhouses and the little nooks around my home. Still, I loved this article! I need to check out other local birds and set up the right houses for them as soon as I can! Thanks for your comment! Purple Martins are interesting to watch. They can be somewhat noisy if they are close to your house but that doesn’t bother me. Just watching them dive after an insect over the water is pretty cool to watch which makes it all worth it.